Lily is a fell runner but she can’t seem to win any of her practice races as she always gets beaten by the same person! This worries Lily because she has her big race coming up, which will be her best chance to impress her gran; if her gran can even remember who she is! Lily’s gran has Alzheimer’s and everyone is finding it difficult to deal with this. However, when Lily’s gran finds out Lily likes fell running, she is over the moon to discover that another member of her family is a fell runner. Lily’s great-great grandfather, Ernest, was a runner too! When Lily reads his diary she is inspired as she finds out about how WW1 affected her family and affected Ernest’s running. Can Lily win the race? Does her gran’s Alzheimer’s get worse? Read this fantastic book to find out! 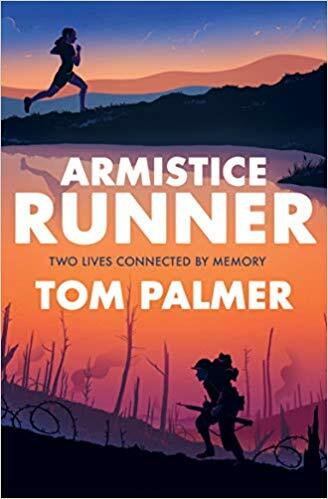 We were delighted to be given this book by Tom Palmer as we love his books. Thank you so much Tom for sending it to us. We recommend this book to 8+ readers who enjoy reading about historical events and stories based on real-life situations. Remember, “If someone is troubled, be the first to comfort them. Then you can be proud of yourself”.